Despite the Communist takeover in the mid-1970s, the landlocked country of Laos remains a Buddhist country in everything but name. Patriotic holidays are still celebrated with some fervor, but only on Buddhist holidays do the Lao people really let their hair down and celebrate with good local food and plenty of strong drink. Laos' holidays are movable feasts based on the Vietnamese and Thai lunar calendars, following local Buddhist tradition. Due to the variance between the Gregorian calendar and the traditional Lao calendar that determines local holidays, we've included each celebration's Gregorian equivalent up to 2022. This holiday takes place on the fourth lunar month, celebrating the birth of the Buddha reincarnated as the Prince Vessantara. Monks bring the Vessantara Story Cloth through town in a procession known as Phaa Phawet. Believers make merit by listening to a non-stop sermon on the birth of Vessantara, read from 14 sets of palm leaf manuscript. Bun Pha Wet is set at different dates in different villages, so Lao townsfolk can celebrate the holiday at home and visit other loved ones at other villages for their respective celebrations. Bun Pha Wet is also a favored time for Lao males to enter the monkhood. The most scenic celebrations of Bun Pha Wet take place at That Luang in Vientiane and Wat Phu in Champassak. Like Chinese New Year all around the region, the holiday's three days are marked with raucous parties, exploding firecrackers, and visits to temples and family reunions. Vietnamese and Chinese businesses will be closed at this time. On the night of the full moon, Makhaboucha commemorates a speech given by the Buddha to 1,250 monks who arrived spontaneously to hear him speak. Worshipers circle their temples bearing candles to make merit, and religious chanting fills the air. It's said the Buddha laid down the first monastic regulations in his speech, and also predicted his death. Makhaboucha is best witnessed in Vientiane and at Wat Phou in Champassak; at the latter, locals celebrate the Wat Phou Festival, when the ruins of Wat Phu come alive again with traditional festivities including buffalo-fighting, elephant racing, and performances of Lao music and dance. The Lao new year commences in mid-April, lasting three days. The whole country shuts down to worship and celebrate - Buddha images are washed, offerings made at the temples, and votive sand stupas are made in yards all over the country. Finally, Laotians spray water gleefully upon one another. As the temperatures are rising at this time of the year, the constant drenching can be a great relief from the heat. For the locals, the water festivities are their way of calling for rain from above. The most picturesque celebrations of Bun Pi Mai happen in Luang Prabang. Cambodia, Burma, and Thailand celebrate this holiday as well - the Thai celebration is better known as Songkran. Khao Pansa marks the beginning of the Buddhist equivalent of Lent - a time of fasting and contemplation for monks, and the best time of the year to enter monkhood. Lao men traditionally enter the monkhood for a brief time before they marry; this time of year is marked with ordinations taking place everywhere. The monks retreat during this period, settling down in monasteries and forgoing the usual practice of traveling from temple to temple. This begins at the full moon on July, and ends on the full moon in October on the day known as Kathin, or Awk Pansa. The Lao have immense respect for their dead kin, and they demonstrate it on Khao Padap Din. Lao families exhume their dead and cremate them, then present gifts to attending monks who have prayed on behalf of the dead. Devotees also make offerings at local temples. On the lighter side, this day is also marked by boat races on the Nam Khan River, as well as a trade fair in Luang Prabang. The three-month Buddhist equivalent of Lent, begun on Khao Pansa, ends on Awk Pansa. On this day, monks roam free from their respective temples, and are presented with gifts from worshipful townsfolk. 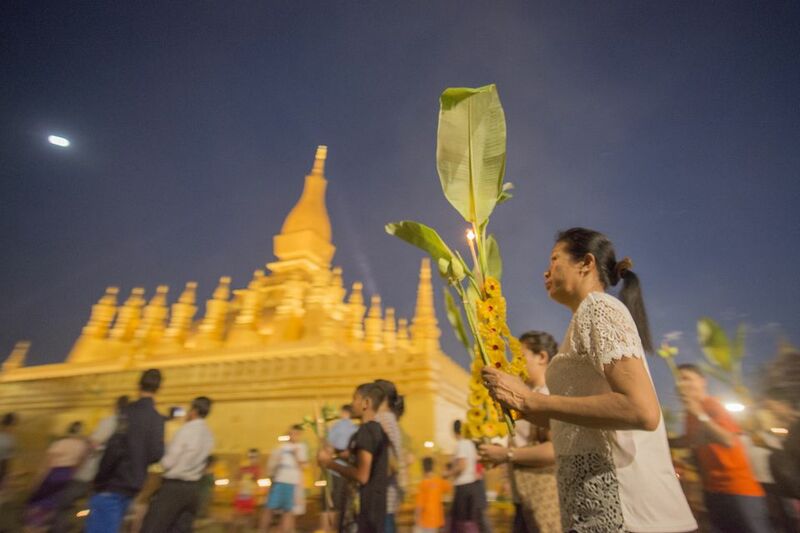 As evening falls on Laos, people release banana-leaf boats with candles and flowers on top, a ceremony known as Lai Hua Fai (similar to Loy Krathong in Thailand). Riverside cities like Vientiane, Savannakhet, and Luang Prabang celebrate the day with Bun Nam boat races along the Mekong. On December 2, 1975, the proletariat finally prevailed over the monarchy. The government marks this day with parades, speeches by Lao politicians, and displays of the hammer and sickle everywhere. Poorer communities sometimes postpone their Awk Phansa celebrations to coincide with Lao National Day, saving themselves the considerable expense of celebrating two major holidays only a month apart.